High-tech fertilisers and innovation continue to change the way growers are managing their crops, particularly in areas close to the Great Barrier Reef. While the amount of phosphorus, pesticides and sediment is on the decline, the level of dissolved inorganic nitrogen remains high in reef waters. Improving nitrogen management therefore remains a priority for agricultural industries in the Wet Tropics. Best management practice of nutrients is now a priority; ensuring that the nutrients used by farmers stay on their farms and are not washed away is driving the introduction of high-tech fertilisers and technological advancements in fertiliser application including stool splitters and variable rate applicators to name just a few. Growers throughout Queensland have taken up the challenge and many are leading by example as they trial new ways to protect their livelihoods as well as the wider environment around them. Babinda cane grower Angle Mustafa has taken advantage of funding provided by the Australian Government’s Reef Programme, with three initiatives in operation on his farm, each directly tied to reducing nutrient, pesticide and sediment run-off into the Great Barrier Reef lagoon. Angle now uses a triple row fertiliser box and stool splitter as a way of applying nutrients sub-surface, ensuring products are put where they are needed most and preventing excess nutrients washing away. Weed control is also being undertaken with a best management practice approach using a banded spray rig to reduce the amount of herbicide applied and targeting the application. A third project to channel excess water with a series of underground pipes is helping to reduce sediment run off. Watch more. sub-surface nutrients to his crops. 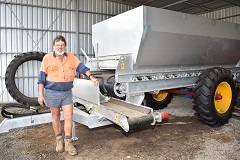 Innisfail sugarcane grower Joe Zappala has also welcomed the Australian Government’s Reef Programme which helped fund a new purpose-designed stool splitter and fertiliser box enabling him to keep pace with environmental best practice in applying sub-surface nutrients to his crops. Efficient application of nutrients is just one area where Joe is playing a role in minimising the impacts of farming on the Great Barrier Reef, replicating the same approach to herbicide management with the use of a variable rate spray controller designed to cut down on herbicide usage through a more accurate application process. Watch more. equipped Case IH 8800 machine. In an industry where keeping up with costly new technology helps to achieve best management practice on-farm, a group of Innisfail growers joined forces to meet the challenge head-on. Established in 1970, Sundown Harvesting is a partnership between four farming families with a specific interest in harvesting. The co-operative has successfully sought funding for equipment through the Australian Government’s Reef Programme, including a GPS and auto-steer system on the planter and harvester, and a variable rate control system attached to a four-tonne triple row stool splitting fertiliser box. Read more. 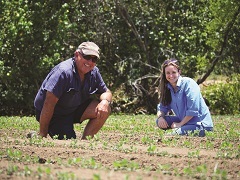 The improvements Burdekin Delta cane grower Mark Castelanelli is making to the family’s 400-plus hectare farm in the name of increasing productivity are as constant as they are varied. By drawing on the knowledge and science available and using grants to add further weight to his on-farm investments, the second-generation farmer is embracing practice change as a way to boost business efficiency while reducing environmental impacts. Mark put his nutrient application under the microscope, taking part in the NQ Dry Tropics Sugar Innovations Program – Enhanced Efficiency Fertiliser trial with the aim of reducing nitrogen inputs, while maintaining production. And results from the first harvest season showed no difference in productivity, the outcome giving Mark the confidence to reduce his nitrogen application over the entire farm. Mark’s approach has been assisted by the support of the Reef Trust Tender–Burdekin, giving growers in the region the chance to access funding to help improve nitrogen and irrigation management practices. Read more. 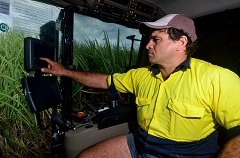 A quest to find efficiencies and cut production costs while maintaining yield and reducing environmental impacts was the driving force behind an innovative fertiliser trial carried out by Childers cane grower Chris Russo. In an industry first, the 36-year-old Isis grower trialled a split application strategy that includes injecting liquid fertiliser directly into the root zone up to 150 days post emergence. The system has the potential to change the way cane growers across the industry fertilise their crops. Chris secured funding under the Federal Government’s Reef Programme to conduct trials of his innovative fertilising strategy. Read more. Cairns region cane growers have teamed up with Terrain NRM and the Australian Government’s Reef Programme to improve the quality of water flowing into the Great Barrier Reef lagoon, by designing, building and trialling a unique variable rate applicator that has the potential to dramatically reduce inorganic nitrogen use on cane farms. 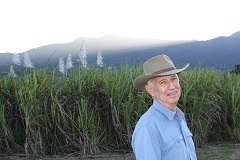 Babinda grower Lindsay Travers is one of the farmers who signed up to the trial, and while he believes nitrogen reduction targets in the government’s reef plan are ambitious, he is confident significant reductions are achievable. “They want to reduce nitrogen by 80 per cent, which I think is a little bit high. Even if we can cut it down to 50 per cent that would be a massive achievement and it’s possible through projects like this,” he said. Read more. The key to efficient fertiliser use, in all industries, is the old but highly relevant set of guidelines called the 4R’s of efficient nutrient management – apply the Right Product at the Right Rate, at the Right Time and in the Right Place, according to Professor Mike Bell, from the University of Queensland, Gatton campus. “The Holy Grail for efficient use of fertiliser is to minimise the risk of offsite loss, so a grower can confidently apply only the amount of N the crop needs to meet it demands for growth,” Prof Bell says. “Ultimately, the objective is to develop decision-support tools and fertiliser products that will allow industry to confidently apply the right blend of fertiliser products at the right rate and time to ensure efficient use in growing productive crops with minimal off-site impacts. Innovative machinery to allow flexibility in time of fertiliser application, combined with fertiliser technology to control the availability of N in the soil, offer real opportunities for major advances in sugarcane N fertiliser use efficiency.” Read more. 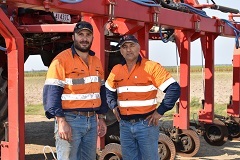 Third-generation Ingham cane grower Paul Mizzi is designing a prototype ripper to reach soil more than 1m beneath the surface — and he hopes the end result will be a win for farms and the Reef. The 2017 Herbert Grower of the Year has received an innovation grant from the Australian Government under its Reef Trust III programme to design and manufacture the zonal ripper that will break through compacted layers of soil and reduce water and fertiliser run-off. The long-time innovator – who has successful designed and built new machinery in the past, including a two-row harvester, a zonal ripper rotary hoe and a high-rise spray unit – says the financial and technical support of government and industry bodies is helping the industry to improve land management practices. “These kinds of grants give you the opportunity to accelerate things,” he says. There are many unknowns at this stage and a bit of a road ahead of us but if all goes well this (project) will lead to both environmental and productivity outcomes.” Read more. in the new satellite technology trial. Three Tully growers are trialling new satellite technology to address crop yield variations within blocks, with funding coming through an Innovation Grants program delivered by the Wet Tropics Sugar Industry Partnership (WTSIP) on behalf of the Australian Government’s Reef Trust III initiative to improve water quality to the Great Barrier Reef. Joe Marano, Chair of WTSIP, said there was a trend in the cane industry towards more tailored use of fertilisers and inputs. “Matching inputs more closely to crop requirements has several benefits for growers back pockets as well as the environment,” he said. “The cane industry is constantly evolving and looking for ways to refine the use of chemical inputs. While it’s a lot of work changing farming systems and what works on one farm may not work on another, the technology and data now available present a lot of opportunities to enhance traditional farming methods.” Read more.